More fodder for global warming skeptics comes from a report by two World Bank affiliates in the November-December issue of World Watch. The article, “Livestock and Climate Change,” does not deny the reality of global warming or the role of livestock in accelerating it, as presented in the 2006 UN Food and Agriculture Organization’s report Livestock’s Long Shadow. Rather, authors Goodland and Anhang assert that the UN FAO report, which is the definitive study of this topic, understates the volume of livestock greenhouse gas (GHG) emissions by a whopping 400%. Which makes the climate change researchers at the FAO – and people like me who have relied on their analysis – look like idiots. But if the FAO report really is massively wrong, out the truth must come, regardless of the resulting damage to the credibility of climate research. So, are Goodland and Anhang courageously exposing a botched analysis, or disingenuously furthering the anti-meat cause with a botched analysis of their own? First, the sniff test. Goodland and Anhang’s revised GHG estimates imply that livestock are responsible for 51% of anthropogenic global warming! Really, with all our heavy manufacturing in industries from construction to apparel? And all the clever ways we move without actually moving, from elevators to 747s? And all the heating and air conditioning that leaks out our doors and windows? And the long showers and the dishwashers? And (let’s not forget) all that breathing we do? Over half of our emissions come just from livestock? Intuition is not in Goodland and Anhang’s favor. And if you did think that livestock breathing emissions should be added back into total emissions, you should also add human breathing emissions back in. So when Goodland and Anhang conclude that livestock emissions are 51% of anthropogenic emissions, they are conveniently neglecting another major source, thereby incorrectly inflating the proportion that comes from livestock. Next the authors tackle land use. They acknowledge that the FAO counts emissions from converting land from forest to livestock use, but say the estimate is too low because it doesn’t count emissions from all the pre-existing land used to support livestock, which could instead be used to grow climate-friendly biofuels. That’s like saying we should count my bathroom floor as a GHG emitter, because I’m not currently growing biofuels on it. Nutty. Then the authors get into the tricky business of trying to figure out how to appropriately convert units of methane, which is a GHG released by livestock as they burp, fart, and poop, to CO2-equivalent units. (Emissions of different gases have to be converted to CO2-equivalent units so they can be added together to get a picture of total emissions.) Methane is a far more potent GHG than CO2, but CO2 lasts much longer in the atmosphere. Therefore, the shorter the timeframe you choose to analyze, the worse methane emissions look relative to CO2. Goodland and Anhang suggest that instead of using the 100-year timeframe proposed by the FAO, we analyze emissions over 20 years. This triples how bad methane emissions look once they’re converted to CO2-equivalent units. Here, neither the FAO nor the authors is correct, and neither is incorrect. The choice of timeframe is subjective – if you’re interested in short-term effects of emissions, you’ll choose a shorter timeframe, and if you’re interested in impact over several generations, you’ll choose a longer timeframe. Certainly it’s disingenuous to suggest, as the authors do, that the FAO understates emissions. The FAO is just studying a longer timeframe. Then the authors have the nerve to avoid recalibrating methane emissions from non-livestock sources as they did for livestock, saying it requires “further work.” So, just as they did with livestock breathing emissions, they inflate livestock methane emissions but conveniently neglect to inflate non-livestock methane emissions. Then of course the percent of emissions from livestock looks astronomical. Finally, the authors have a catch-all “other” category for miscellaneous emissions they claim the FAO understates. The rationale for increasing the estimates of these “other” categories is often that the FAO is using old information – from the 1990s and early 2000s, mostly. But we know that livestock inventories have increased since then, so we know livestock emissions must have increased too, the authors argue. Yes. And, I would add, we also know that the Chinese are driving a hell of a lot more cars, so emissions from the automotive category should increase. And flying more, and consuming more imported designer clothes… Again, if you’re going to increase livestock emissions to more accurately capture what’s happening in the year 2009, you have to increase all these other categories of emissions as well. But Goodland and Anhang don’t, and that’s why they come up with the eyeball-popping and totally false conclusion that over 50% of current GHG emissions come from livestock. In sum, we already knew that eating meat was a big driver of global warming. No need to bolster the case with inflated numbers and trumped-up analysis. But thanks, Goodland and Anhang, for making climate change research an easy target for all those naysayers out there. Thousand Hills Cattle Company is huge on the Minneapolis organic/local/sustainable food scene. If you’ve been here and eaten any part of a cow at one of those restaurants whose menu lists where its food comes from, it was probably from Thousand Hills. The company distributes beef from Upper Midwest family farms which pasture their cattle for their entire lives, contrary to the conventional industrial practice of “finishing” them in confined feedlots. At a recent screening of the movie Fresh, the owner, Todd Churchill, gave a speech about why he’s such a proponent of keeping cows on pasture. Todd extolled the many virtues of pastured beef for human health, animal welfare, and the environment. It’s hard to argue with his view that raising animals on pasture is better than keeping them in confinement, but one of his claims struck me as a bit disingenuous. “Who has heard,” he asked, “that you should be a vegetarian if you care about global warming?” Several people in the audience, including myself, raised their hands. “Well,” said Todd thoughtfully, “that’s true if you’re talking about industrial cattle production. But what’s the energy source for my farmers’ cattle?” An audience member dutifully raised his hand and called out: the sun. “Yes,” said Todd, “that’s right – we feed our cows on grass that uses the sun’s energy. We don’t fertilize and till grain. We use almost no tractors.“ So, the implication was, if you just stick to grass-fed beef you avoid all those nasty chemicals and pollutants that are cooking the earth. No need to give up those burgers. Is it true that eating pastured beef is just as good, from a global warming perspective, as being a vegetarian? Well, if the aspects of beef production that cause global warming are the fertilizer and tractors that go into it, then eliminating them would make eating beef climate-friendly. If not, we have a problem. Houston, we have a problem. Turns out only about 4.5% of livestock greenhouse gas emissions come from fertilizers and on-farm fuel use (e.g., to run tractors). The biggest portion – over 35% – is due to deforestation and desertification, which happens when forest or other virgin land is cleared to provide space to graze animals. Now, to be fair to Todd, if the farmers he works with are using existing grassland rather than clear-cut forests to graze their cattle, they aren’t contributing to greenhouse gas emissions in that way. So add that to the savings from forgoing fertilizer and tractors and they are cutting emissions about 40% by raising cattle on grass. 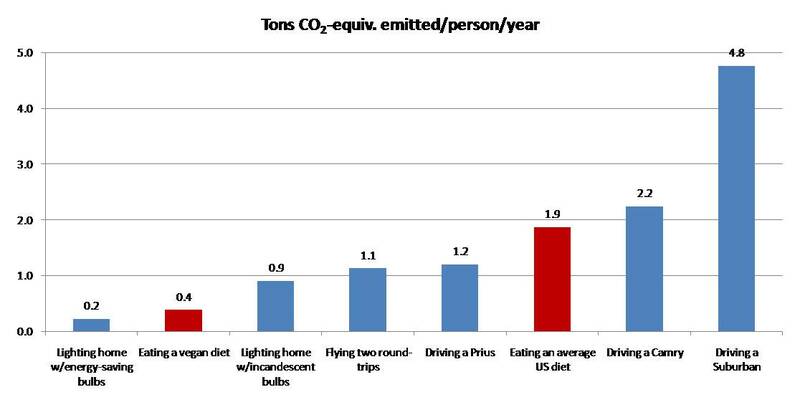 But two other categories of emissions kind of smack you in the face when you look at that UN pie chart – the emissions from manure (pooping) and enteric fermentation (burping and farting). No, this isn’t the burping and farting that the guys on the tractors do while they’re bouncing along the prairie; this comes from the animals and as such is not eliminated in Todd’s world of happy cows on pasture. Again, I’ll give him the benefit of the doubt and shave 9% off because certain emissions happen when poop that’s been deposited on the ground gets leached or eroded away, and according to the UN that’s negligible for grassland. So Todd has saved 49% of emissions farming his way, which leaves 51% of livestock emissions still there, even in his relatively clean system. His cows may be happy, but they still poop. Score one point for the vegetarians. *Pie chart is from UN FAO as quoted in McMichael, Powles, Butler, and Uauy, “Food, Livestock Production, Energy, Climate Change, and Health,” The Lancet 370 (October 6, 2007): 1258. Information is for all livestock, not just cattle, but cattle are worse than average emitters of greenhouse gases. Therefore using these numbers understates their emissions.